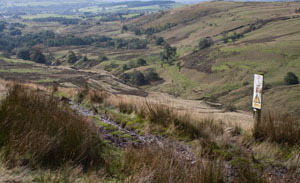 The route involves two climbs, but neither are very steep. 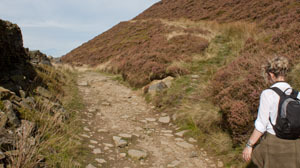 Most of the route follows clear paths (even if they are not all marked on the map). There is a section on the top which is unclear and boggy after wet weather. 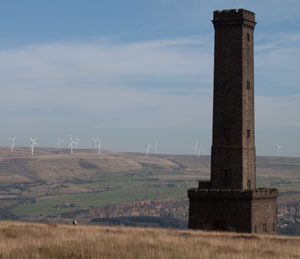 As long as there are no low clouds, Holcombe Tower acts as a very prominent navigation aid on this section! 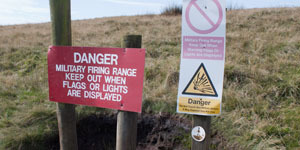 Some of the paths skirt an MOD firing range - it's worth following the link below to check if it is being used before setting out. Refreshments: The Shoulder of Mutton at the start and end of the walk (though it doesn't open until noon). More choice available in nearby Ramsbottom. 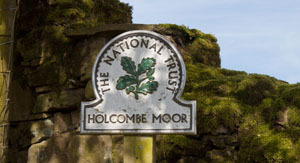 Leave the B6214 by walking up Moor Road (directly opposite the Shoulder of Mutton. 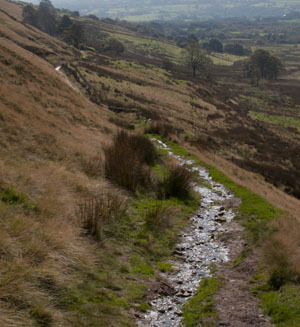 Continue along the main track to enter National Trust owned land - and carry on ahead. 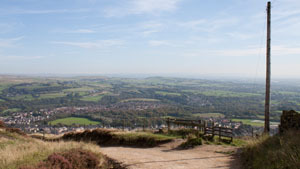 To the right there are splendid views across the valley to Scout Moor Wind Farm. I don't know if the animals pictured here are a permanent feature of Chatterton Close - but they provided some interest on our left, in contrast to the views to the east pictured above. Shortly after passing the buildings at Chatterton Close there is a wood on the right. At the end of this there is a junction of paths. 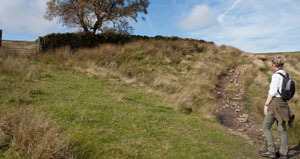 Turn left, following the bridleway sign towards Beetle Hill. 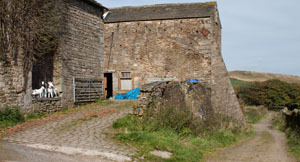 This paths leads more steeply up towards a gate in a wall. Don't go through the gate, but continue along the clearer track which leads to the right of the wall. The map shows the path leading to a crossroads, but on the ground we followed a clear path which forked left to the top corner of the fields on the left. At the junction of paths turn left. The map shows the path running alongside the range, rather than entering it - but I wouldn't like to follow this route when live firing is taking place! During the month we completed the walk (September), the range was only being used in the evening on a small number of evenings. The clear path leads to the stone in the centre of this picture. For more information abort this, follow this link. Beyond the stone the path leads down the side of the valley pictured, providing impressive view to the west. At a junction of paths, we intended bearing left to climb again. Although a path is marked on the map, we saw no sign of it on the ground, so continued along the level track leading south. 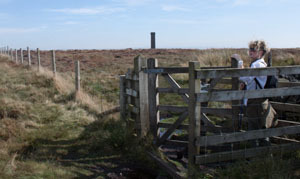 ... but did lead us to this kissing gate, which we passed through. 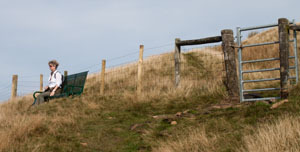 The post and wire boundaries didn't match up with the map, and the path almost ceased to exist. But we could see the top of the monument, so navigation was no problem. Trying to avoid sinking in wet muddy patches or tripping over heather were greater issues! I left the direct route to take this photograph - the small figure is heading directly from the kissing gate to the tower. We arrived at the back to the tower, walked round it and turned right, heading south along a clear track. 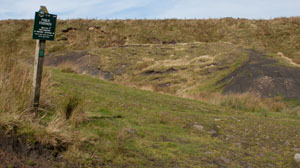 The track bends round to the left, and zig-zags down the hill. Turn left onto Moorbottom Road. 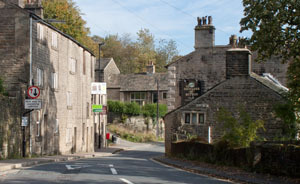 At the junction with Holcombe Old Road and Cross lane, turn left to head back to the pub. If you have parked on the car park and wish to return directly to it, turn right. The map show a concessionary path on the left leading to the car park. We went to the pub!